This is an experimental electric car, painted to conceal its manufacturer. If you are a very, very early adapter, you may already be driving a forerunner of this electric car. One of the interesting things about this car is that it is not tiny. You don’t look at it and think of bouncing it down the street with the flat of your hand. It’s bigger than my Civic; looks roomy and comfy in there. It has four doors. It has a trunk. Another interesting thing about it is that, despite the attempt to conceal the manufacturer, this is a Ford. The pointy black and white paint job, which must have been big fun for someone to apply, did not conceal the characteristic oval Ford emblem on the front of the hood. A little Internet snooping suggested this may be the 2013 Ford Fusion Energi, Ford’s coming contender in the plug-in electric market. Where did I see it? Just parked casually among a bunch of other cars, on a lot by Detroit’s Eastern Market, one day this summer. Just hanging out with the other cars like it was nothing. 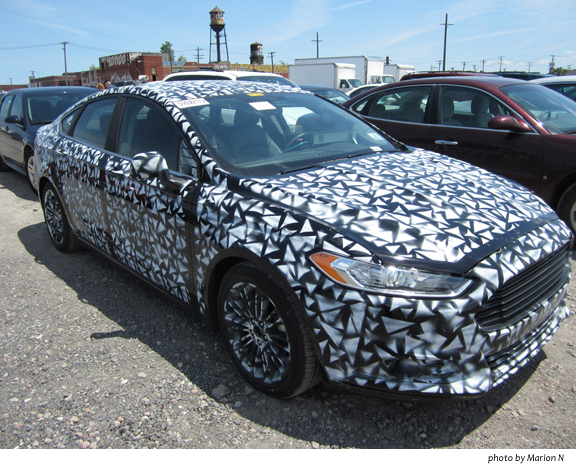 This entry was posted in Uncategorized and tagged Detroit, Eastern Market, electric car, Ford Fusion Energi. Bookmark the permalink.